With more than 284 million views on YouTube, "Nice for what" is a song dedicated to hardworking young women, who get played around by their boy friends time and again. Released on the 6th of April 2018, from his studio album Scorpion, "Nice for what" topped the Billboard Hot 100 charts for 7 weeks, and is the only non consecutive no.1 song of Drake in the year 2018. Both "God's Plan" and "In my feelings" topped the Hot 100 charts 'week after week' but never made a comeback after they lost the no.1 position. 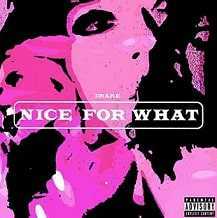 With a female star studded celebrity cameo appearance, "Nice for what" motivates and energizes all the young women, who are struggling to make their ends meet. Drake is one of the very few artists who dedicates a song or another (time and again), to the working class, if "God's Plan" was dedicated to the lower middle class Afro-American families in the US, "Nice for what" is for all the female fighters out there. The song features cameo appearances by Olivia Wilde, Misty Copeland, Issa Rae, Rashida Jones, Jourdan Dunn, Tracee Ellis Ross, Tiffany Haddish, Yara Shahidi, Zoe Saldana, Elizabeth and Victoria Lejonhjärta, Letitia Wright, Bria Vinaite, Emma Roberts, Syd and Michelle Rodriguez.